ESSAY I learned how to drive in a 1952 Plymouth that we called the Green Bullet. It was a stick shift, more than ten years old, with a transistor radio that dangled from a knob on the dashboard. We turned the knob when we wanted to put the windshield wipers on. The car’s name was related to its appearance, not its speed. My then-boyfriend, Gary, taught me how to drive. There was no such thing as drivers ed in our school in those days and my father wouldn’t teach me. He believed women should not be allowed to drive because they adjusted the mirror and checked their lipstick before turning on the car and that just wasted everybody’s time. After Gary and I had been married a couple months we woke up one morning to discover that the Green Bullet was gone and a silver Valiant was parked in its place. My father-in-law had purchased the Bullet for fifty dollars and now had an opportunity to trade us up to this new car, and just did it in the night. We mourned because we had a fond place in our hearts for the Bullet. Also, we were offended that we were not being recognized as adults who could make our own decisions. Besides, the Valiant, which we promptly named the Midwest Twang, would not start in the rain – we lived in Chicago! – but made a twangy sound when we turned the key on a wet morning. Before long we decided to assert our independence and get rid of this car that was so much trouble. 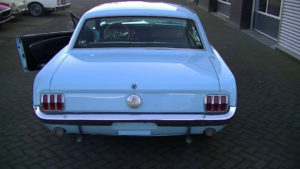 We bought a sky blue 1966 Mustang. We even handled the bargaining part of the experience with aplomb. At one point we felt the dealer was trying to take advantage of our obvious inexperience and I turned to Gary and said, “Call your father.” The guy backed down immediately. The car cost $2,000, an outrageous amount in everybody’s opinion. But we loved that car and thought it was worth every penny. And then, in 1967, disaster of a sort struck. We had a baby. In those days they didn’t have all the neat folding strollers we have now. Try as we might we couldn’t find one that would fold up and fit into the trunk of our car. It was the baby or the car and we’d grown quite fond of our little darling. We had to sell the Mustang. We moved “up” to a Chevy Impala, which we hated. In fact, we never did love another car like that Mustang.